Bug #1076029 “[regression] Notification area applet can't displa...” : Bugs : Getting Things GNOME! Hi, which distribution / desktop environment are you using? > Hi, which distribution / desktop environment are you using? 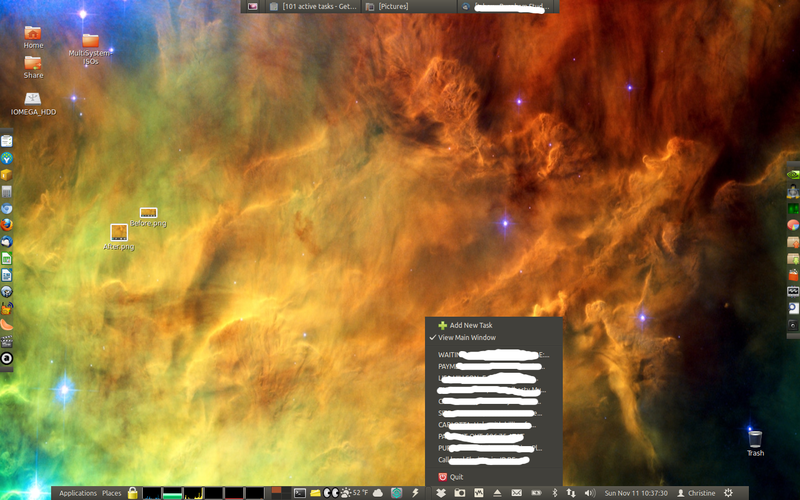 I can't reproduce it (yet) on ubuntu 12.04 with gnome classic. Could you run gtg from a terminal in debug mode (gtg --debug) and append the output as the indicator applet crashes? Also please post any relevant lines from ~.xsession-errors. 2012-11-09 15:33:48,013 - DEBUG - gtg:core_main_init:139 - Debug output enabled. Hm... there is nothing interesting in the log. What do you mean by "restart of gnome panel resolves"? How do you restart gnome panel? So you say that an icon of GTG disappears but not the menu for that indicator? Could you please make a screenshot of it? I have a trouble to imagine it. I'll use the 'killall gnome-panel" to restart gnome panel. Weird. What about ~.xsession-errors? Do you see anything suspicious there as the icon disappears? (gtg:7822): LIBDBUSMENU-GLIB-WARNING **: Trying to remove a child that doesn't believe we're it's parent. Christine> I was able to reproduce it. It is a regression introduced by me :/ in revision 1239. Thank you for reporting it! Glad I was able to help Izidor - Thanks again and love the software! Sorry Izidor, this bug was really annoying for me so I got it fixed in the meantime, see related branch. Unless you have already worked on it, would you consider it for merging? BTW I assume the problem only appears when using the libindicator api. Antonio> I am sorry, I frogot about this bug. I solved the problem by installing GTG icons to /usr/share/icons where all icons should be placed. It should work now. It looks like it is still happening on 13.04, I used the workaround described in https://bugs.launchpad.net/gtg/+bug/1079589/comments/4 and it worked.